Members of the EOF 2017 graduating class. 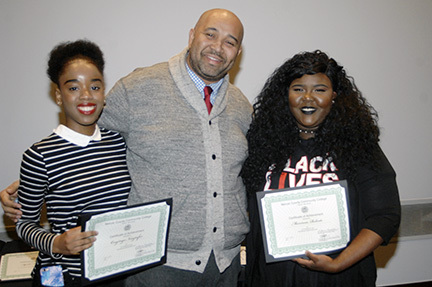 Onyinye Nnajiofor (left) and Monissia Roberts (right), EOF program members who were named to the President's Honor List for attaining a 4.0 grade point average, with Charles Weatherspoon, EOF Student Services Coordinator. O'Dean Eccleston, EOF Class of 2017 student speaker at the EOF Honors Ceremony. WEST WINDSOR – In a May 11 ceremony that served as a prelude to Mercer County Community College’s (MCCC) Commencement, graduating Mercer students in the Educational Opportunity Fund (EOF) program celebrated their achievements – and paid tribute to a beloved professor they lost over the past year. A sorrow that was shared by all EOF students and staff was the passing of Professor Maria Rodriguez in December, who was a member of the EOF staff for more than 30 years. 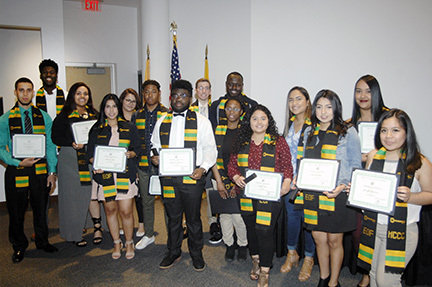 This year the EOF program established the Above and Beyond Award as a lasting tribute to Rodriguez and her dedication to EOF students, which was evident in the words of students participating in the honors ceremony at The Conference Center at Mercer. 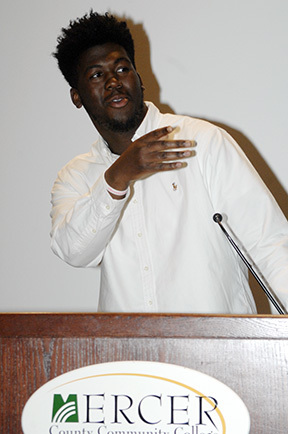 “She brought out the best in me,” said O’Dean Eccleston, an EOF graduate who offered his testimonial at the event. “She would tell you the truth in the nicest – but meanest – way,” he said with a grin. Eccleston said his path to graduation was not an easy one, as it took him four years to complete his degree due to family and work obligations. But through hard work and with the support of his fellow students and the staff of the EOF program, he was able to accomplish his goal of a college degree. Eccleston has been accepted at The College of New Jersey, where he will begin classes this fall. Glendy Pineda, a 2016 graduate and EOF alumni speaker at the event, is also attending TCNJ and echoed Eccleston’s appreciation of the program, which helped her achieve her own academic goals. In 2017, 21 members of the EOF program received their college degrees. Two were named to the President’s List for achieving a 4.0 grade point average, and another 31 were recognized for high academic achievement , with a GPA of 3.0 or higher. Dr. David Edwards, MCCC’s Vice President for Academic Affairs, said New Jersey’s EOF program serves as a national model for other states committed to providing educational opportunities for economically disadvantaged students. “The Mercer EOF program represents best practices in higher education,” Edwards said. “Students are served proactively from the moment they enroll in the college, including academic support, enrollment advisement, personal counseling, and transfer and career mentorship.